Recently I was reading one of my favorite magazines, when I glanced over an article about flying with a pet. The logistics of pet travel can be complicated. If you're traveling with a cat or dog this coming holiday season, you may want to look into what is required by the USDA's Animal and Plant Inspection Service (APHIS), the TSA, and the Airline or Ferry System that you will be using. The rules vary depending on your destination, so it is important to consult with your veterinarian early in the planning phase of your trip. Some places, such as Hawaii, require documentation starting at least 6 months prior to arriving to avoid delays. At minimum, your pet will need a vet issued health certificate and proof of a rabies vaccination. To get started on what is required by area, visit the web page www.aphis.usda.gov/aphis/pet-travel. 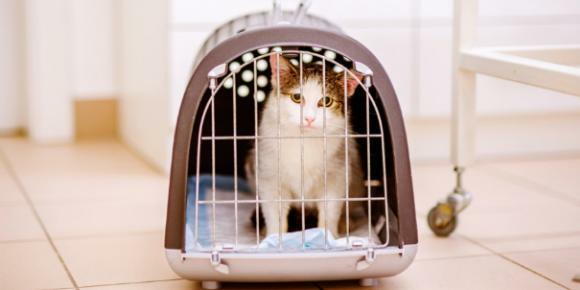 Pets under 20 pounds can often accompany you in a pet carrier in-cabin. If this is an option for you, remember to pack disposable training pads in case of accidents, and fill a container of water after you clear the check-in. Larger animals fly in secured kennels in the cargo area that is temperature and pressure controlled. When traveling on the Alaska Marine Highway System, your pet must remain on the car deck in your vehicle for the entire sailing time; 15-minute pet calls will be made approximately every 8 hours to allow pet owners to be escorted to the car deck. Full AMHS pet rules can be reviewed at https://www.dot.state.ak.us/amhs/policies.shtml. Either mode of transportation can be stressful, so it's best to prepare your pet with kennel training before the big event. If you feel that your pet is still very anxious after kennel training, discuss the behavior with your veterinarian. Medications may need to be prescribed that assist in calming your pet for a smooth and enjoyable ride for everyone.